Posted July 14, 2016 by Staff Writer & filed under Arts & Entertainment, Featured Arts & Entertainment. “Raise your hand if you’ve ever had a problem!” shouted performer Georgina Wood at the beginning of Milk Crate Theatre’s show, Under Construction last week. Although we all encounter problems big and small, a growing problem specific to 1 in 200 Australians is homelessness. In NSW alone, over 28,000 people are sleeping rough. Becoming homeless could happen to anyone. This is an idea that is explored in the Motions Art film Adventures of a Happy Homeless Man. The independent, Sydney-based film will be released later this month. It is described by director Dicky Tanuwidjaya as “a comedy for the thinking person”. “I think many homeless people have interesting stories to tell about why and how they become homeless,” Tanuwidjaya said. Wayside Chapel in Kings Cross is one organisation which has been helping Sydney’s homeless get back on their feet since 1964. In the past few years they have been doing this through creative workshops and classes ranging from acting, to music, to arts and crafts. Wayside Chapel Social Worker Diana Stojanovich explained the philosophy behind the introduction of these classes. “Some of the participants have no connection to anybody else in any way, they don’t have family or friends so they experience total isolation,” she said. “So that’s where the importance of the creative classes really comes through, to include them in things by giving them that social contact and letting them feel part of a community. According to Diana, feedback from participants suggests that they “love it and just can’t get enough”, hence why many of them often attend multiple classes at various organisations around the city during the week. 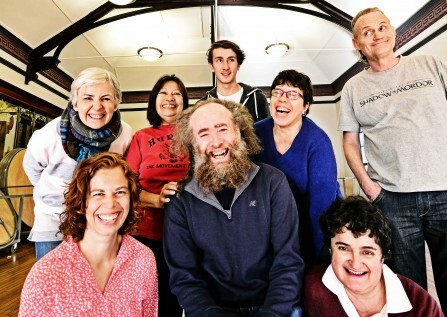 Milk Crate Theatre is another organisation which works to help disenfranchised people through creative outlets; with an ensemble cast made up of artists who have experienced social marginalisation or homelessness. “The artistic, philosophic and political goal of Milk Crate is to use theatre as a tool for change,” said Artistic Director Cristabel Sved. Ms Sved said that change can result in personal transformations for Milk Crate members through the development of skills, social connections and support networks. “[At Milk Crate] the idea has been to engage a community that is quite silent and to find out what their stories are, what interests them, what they feel needs to be put into the public arena to have a community dialogue about,” said Sved. “Milk Crate has just given me a huge amount of confidence,” said Pauline Trenerry, one of the cast members of Under Construction. Cherie Barnes, an ensemble artist who is involved in the upcoming Meet the Jokers! workshop, said that Milk Crate’s support has been “just priceless”. “Milk Crate has helped me re-engage with the community, get a bit of self esteem and make new friends, but more than anything it’s been crucial to me for re-establishing a good level of mental health,” Ms Barnes said. Since joining the Milk Crate, Ms Barnes has gained a mentorship with the organisation for assistant directing. She hopes to learn more about stage management and wants to pursue postgraduate studies in community education and development. Milk Crate, Wayside Chapel and various other creative endeavors centred around the homeless strive to create compassion through understanding, and aim to explore issues through stories that focus on human impacts, not politics. “[These initiatives] gives a unique opportunity to be able to tell stories that otherwise wouldn’t be heard and to get conversations going to challenge stereotypes and challenge the status quo,” said Ms Barnes. 73 Garden Street, alexandria. Free. Film will screen at Chauvel Cinema, paddington, from July 18–21.